With chicken already in my hands, the cute student’s commentary reminded me that my lunchtime jaunts in Queens may be numbered; Winter is coming. However, I can still walk easy, if bundled up. I’ll treat the last weeks of November-early December as they were my last…to get good food from “exotic locales”. In a sense, Woodside may be quite exotic to some people. It’s my first time there, and it’s pretty tame; the traffic under the green-painted 7 train on Roosevelt Ave. was not bad at all, and the shops seem varied and friendly, like Mister Chicken To Go at the corner of 54th St.
“To Go” is not a misnomer; there are no seats for customers dining-in. Everything is made to go. Besides that oversight, the people working there were quiet and friendly, serious, and I wish that I was a Spanish-speaker so I could rally a good conversation. They are very accessible online/delivery via Seamless, GrubHub and Delivery.com, and phone ((347) 448-6875), accepting all major credit cards. Good to know. “Always fresh, always fast!” is the main tag on the menu, with chicken “all natural & antibiotic free.” Okay then, we’ll see. 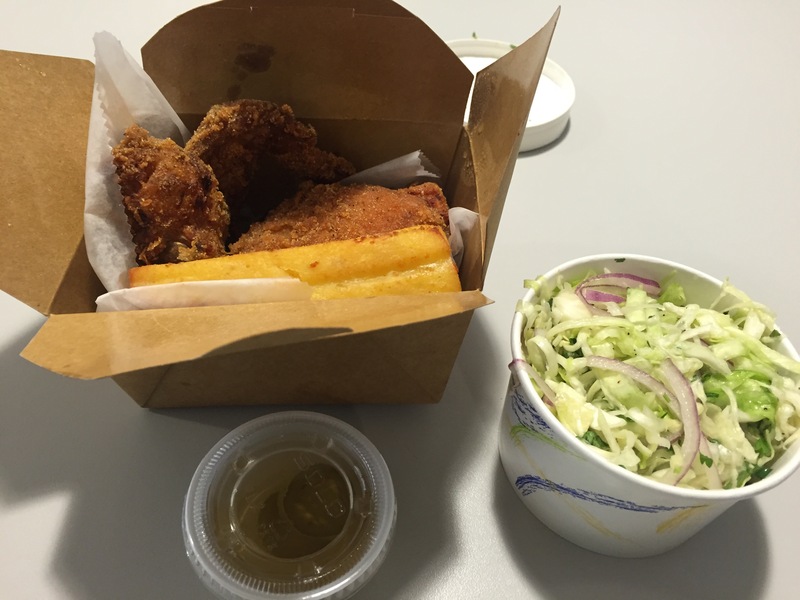 I ordered 2 pieces of fried chicken (comes with cornbread & a side of jalapeno vinegar) and a side of coleslaw. Meal without 1 side: $7.00. Total price w/ 1 side = $11.00. The consensus? The chicken meat was perfect; still hot, moist and tender. The crispy skin was extremely crunchy, thanks to a garlic & dried breadcrumb-based (or cornbread? I can’t tell) batter. I don’t think they used milk for an extra agent for the batter. This chicken would have been perfection with some hot sauce. Ole! Speaking of cornbread, theirs was served like a smooth, cheese wedge, with flecks of peppers in it. Very interesting mouth-feel; was expecting something more traditionally crumbly. Very good taste though. Finally, the one side: the coleslaw. White vinegary with added sugar, with chopped green cabbage, cilantro and red onion. Refreshing and tart. After getting off from the 7 train, the aforementioned cute student (who would do some good if he took off his iPhone ear buds and stopped staring at his phone earlier; he would had made a good extra on HBO’s Westworld) looked up on Van Dam Ave. I can only hope that this upcoming winter won’t be so long….